Budamakayi or Dosakayi (Indian name) or lemon cucumber is a big spherical cucumber which is very popular in southern part of India. In India, Lemon cucumbers are available during summer season. The mild and pleasant taste is complemented by a cool and crisp texture. It resembles a lemon in appearance, the flavour is little bit sweet and less acidic. Lemon juice or vinegar is to be added to make the pickle little bit sour. It is better to use vinegar which works as preservative for pickles as well. 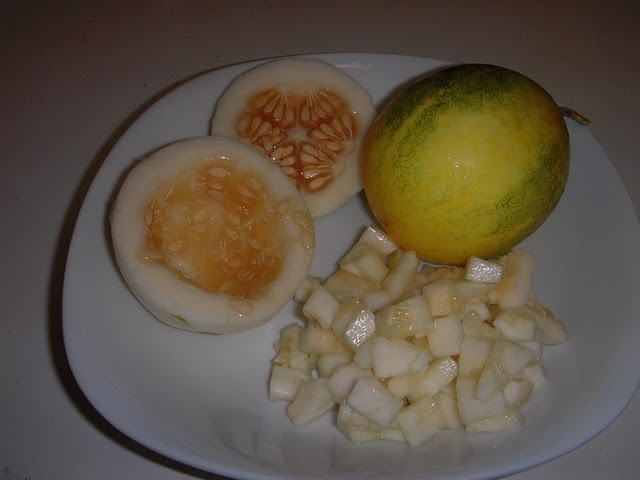 Varieties of dishes can be prepared by using lemon cucumbers, this recipe is one of them. This recipe is a very simple and easy one and more over it consumes very less time and requires very less preparation. The ingredients used in this recipe are commonly available in every kitchen. You can serve it as side dish for breakfast, lunch or dinner. It complements the food with rice, roti, chapati, paratha, upama and all main courses. Let’s see the preparation of hot, tangy and spicy budamakayi uppinakayi. Place a frying pan (Kadhai) on medium flame. Pour edible oil to it, after 2 minutes, add mustard seeds to it. Wait until they start spluttering, add cumin seeds, hing and turmeric powder to it and remove from heat immediately. Otherwise, all ingredients will get burned and taste will be spoiled. Keep it aside to cool down. Mean while you can prepare the other things. Place a small frying pan (Kadhai) on medium flame. Pour fenugreek seeds (methi) into it and roast them until they turn into brown colour and start leaving a pleasant aroma, it may take 3-4 minutes. Grind roasted fenugreek seeds and mustard seeds together to a fine powder. Keep it aside in a small bowl. Wash and clean lemon cucumber. Peel off the skin and cut it into small pieces. If seeds inside are tender, you need not remove them, cut the lemon cucumber along with seeds, otherwise you will have to remove seeds by scooping them with the help of a small sharp edged spoon. Pour pieces of lemon cucumber, roasted fenugreek and mustard powder, salt, red chilly powder and lemon juice or vinegar to cooled seasoned oil (voggarane) and toss it with the help of a spoon. Pour it in a clean and dry bottle and store it in refrigerator. Tangy, spicy and hot budamakayi uppinakayi is ready to serve. Isn’t it simple and easy!.